Several years into my career as an actress, when I was deep in the throes of auditioning, rehearsing, performing, pounding the New York City pavement, working a day-job, or some combination of the above, someone I looked up to as a mentor and role model recommended a book that put an abrupt halt to my chaotic pace and helped me connect with my own creativity in a deeper way. 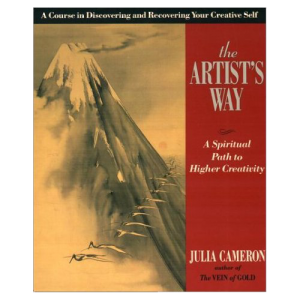 The Artist’s Way: A Spiritual Path to Higher Creativity is a seminal book on creativity, co-authored by Julia Cameron and Mark Bryan. It has been released in many editions and has spawned classes, workshops, and movements of artists eager to discover or recover their creativity. In an era when productivity is the goal of all things, and in a field where resources are slim and competition is fierce, the suggestion of monastic-like creative discipline provides a welcome sabbath in a potentially hectic rhythm of life. The Artist’s Way correctly identifies creativity as a spiritual issue, but its approach is decidedly universal, perhaps even, at times, New Age. Still, Christians who are not going to stumble over the universal nuances will find plenty of truth about God, creativity, and themselves in the pages of The Artist’s Way. For people in the arts, “creative blocks”—those horrible seasons when a person is unable to create (scripts, songs, novels, articles, etc. )—can be personally devastating and professionally fatal. Unfortunately, many artists find that a creative block can become a debilitating issue, especially if their work depends on their ability to produce. The Artist’s Way is an excellent catalyst for getting the creative juices flowing again. The Artist’s Way is, at its core, a workbook, the aim of which is to tap in to a person’s creative core. Cameron, an award-winning playwright, poet, and filmmaker, and Bryan, an educator specializing in human development and psychology, offer practical, tried-and-true methods for tapping into a person’s innate creativity. Divided into twelve chapters, or “weeks,” this beautifully written resource was developed by people who truly understand the creative process. In the fifteen years or so since I first cracked the cover of The Artist’s Way, I have gone through the book three times, first alone, then with a friend, then with a group. Each iteration of The Artist’s Way I’ve done has produced a fresh wave of inspiration and creativity. Nowadays, when I am in need of some creative recovery, I go back to the disciplines of Morning Pages and Artist’s Dates, always to notable results.